Many people overlook the importance of air ventilation when building a dome; even some professional dome manufacturers don''t build in a ventilation system with their kits. This can cause some very nasty problems, including condensation, wet and dry rot, mould, mildew and a generally unhealthy environment. With some simple good building practice you can make your dome a comfortable, fresh and healthy space to be in. 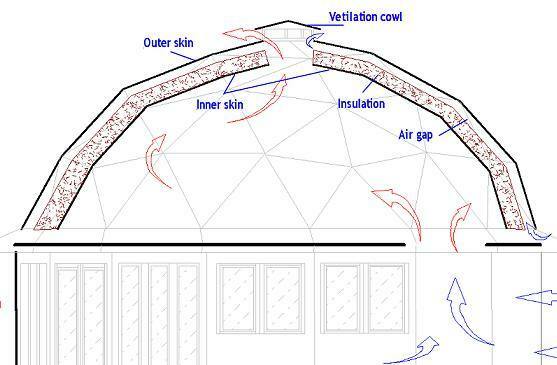 Look at the diagram below to see an example of a properly ventilated dome structure. I would highly recommend building in an air vent at the top of a dome, warm moist air rises and if you don''t provide an escape the humidity will dramatically increase encouraging mould and mildew growth. I would also recommend some trickle vents low down in the dome; this lets cool dry air in at the bottom to replace the moist air leaving the top vent. If you''re bothered about heat loss you can build a heat exchanger into the system to warm the incoming cool air with warm air leaving the building. Warm air holds much more moister than cool air so when warm moist air is cooled the water has to go somewhere, it goes through the inner skin, then through the insulation and finally hits the waterproof outer skin were it condenses on the cool surface. In the diagram above you can see how moister that passes through the inside skin and insulation can be carried away by air entering at the bottom of the air gap and exiting through the ventilation cowl. If your building a geodesic dome from a kit, be sure to ask the supplier what provision has been made to take care of structural ventilation, if your self building skimp on ventilation costs at your peril. The human body evaporates several litres of water a day, more with exercise. Cooking, washing, indoor plants, drying clothes etc can easily bring the total up to a gallon or so a day! Just make sure it has somewhere to go. I am making a dual dome for home. Is 15m long and 8m wide.I want to show you but I cannot put the picture in coment. I have made the air gap but I do not know how to make technicaly the air vent from inside dome to out. If somebody know, please help!